"Ema, I cannot begin to describe how grateful we are for making this such a memorable event in our lives. I will be sure to tell everyone what an incredible job you and your team have done. 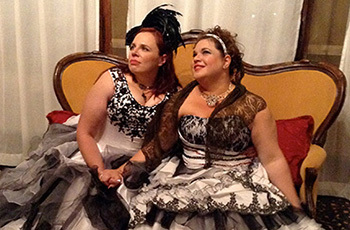 Our wedding in Venice was over-above- and beyond anything we could have expected. Thank you for your kindness and generosity- this was such a wonderful addition to our memory. Thank you Ema. You are simply the best." Watch here the lovely video of Amy and Nicole. Read here on our blog their wedding story. "How do you describe a dream come true? 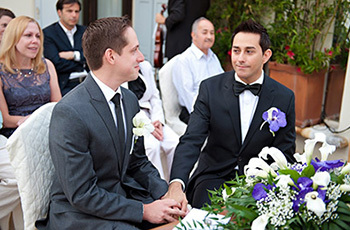 We met Ema via her website venicegaywedding.com and it was love at first sight. Being from the US and only having visited Italy once we gave Ema a vague sketch of what we wanted our wedding to look like. Ema took these rough ideas and made our wedding a memory that we will treasure forever. 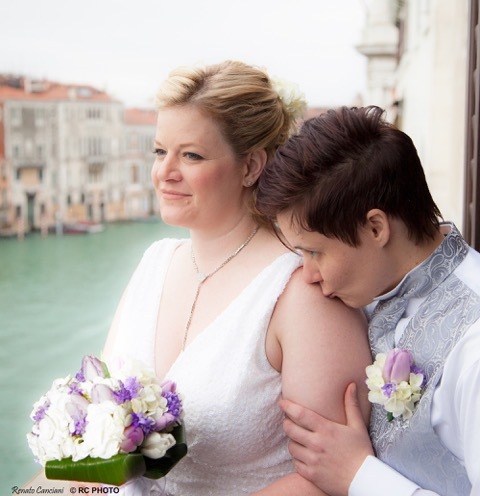 We exchanged our vows overlooking the breathtaking Grand Canal on the balcony of a luxury hotel. Ema used her connections with local business owners to make our floral arrangements a breathtaking picture. Speaking of pictures, Laure, the photographer, spent three days with us capturing the beauty of Venice and the romance of the city and our love. Ema took the time to not only plan our wedding day, but the days leading up to it and after it. She arranged for a band in St. Mark's Square to play a special song dedicated to our dearest friend, who was serving as our maid of honor and gondola rides for our parents. 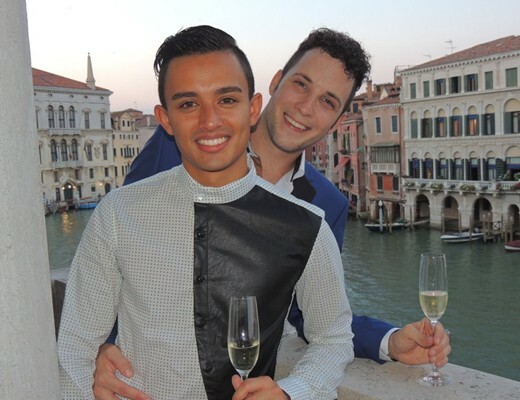 After our wedding we celebrated with a private boat ride to a candlelight dinner on the Lido. Ema started out as our wedding planner, but ended as a member of our family." "Thank you so much for everything you have done to make our wedding so incredible. It even exceeded our expectations. We could not dream of anything that could have been better. Ema, you are a wonder and we are so fortunate to have you as a part of our memories. All our love to you, always!" Where do I begin? The incredible ambiance of the palace made for the most perfect setting. The focal point of the tree was exactly what I had envisioned. The violinist was so gracious and I really adored her. The water taxis were so nice, just like you said they would be. The dinner was MAGICAL, mainly due to your attention to the littlest detail. The textures and colors of the palace made for wonderful photos. I wanted to send you a HUGE THANNK YOUUUUUUU for every single thing you did to make this even so incredible. It was the fairytale I had always imagined and reason you are the WOMAN OF EVERYTHING! I love the video of when we walk into dinner because I was so amazed by the beauty of everything, you really outdid my wildest expectations. Dinner was DELICIOUS and everyone was raving on and on about it. The decor was perfection. I am so thankful I stumbled across your email all those months back. I am also thankful for your diligence in working with me to ensure my proposal dreams came true. You really are a gem and the glue that put our proposal together! I can not wait to visit you and your husband when we're back in Venice and indulge in delicious tiramisu. I will keep in touch for sure, Until we meet again my dear! 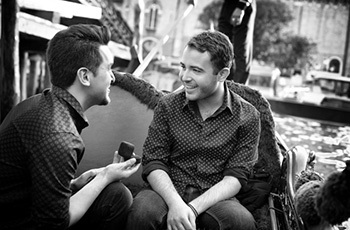 Watch here the lovely video of Wade and Justin.